This website introduces a new mathematical framework for classification and recognition problems in computer vision, especially face recognition. The basic idea is to cast recognition as a sparse representation problem, utilizing new mathematical tools from compressed sensing and L1 minimization. This leads to highly robust, scalable algorithms for face recognition based on linear or convex programming. These algorithms produce extremely striking results, accurately recognizing subjects across large databases despite severe corruption and occlusion (as in the example below). Please browse the links to the left for more information. The introduction section gives a brief description of main ideas of our method. More technical details can be found in the references section through our publications or related literature. The applications section showcases results on some specific recognition problems. A prototype face recognition system will be made available in the demo section. A patent has been filed by the University of Illinois, with relation to this work. Please visit our code page for details on the patent. An L1-norm minimization benchmark package, which contains implementations of several popular L1-norm minimization algorithms in MATLAB, can be downloaded here. [Project Website]. Pop-sci essay: A Q&A about recent advances in face recognition and how to protect your facial identity. 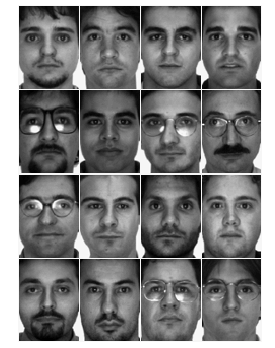 A face recognition system is typically provided a set of training face images of multiple subjects under different illumination conditions or with different facial expressions. The goal is to identify a test face image as one of the subjects in the training set. 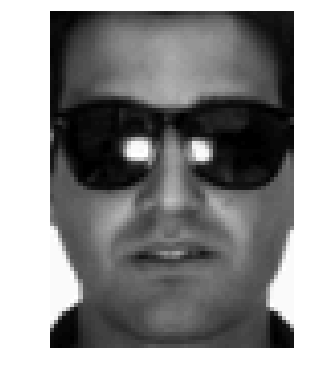 Real-world scenarios demand robustness to partial occlusion, like disguises for instance. A visual example of this scenario is given below. For 100 subjects (50 male and 50 female) from the AR database, our algorithm achieves 100% recognition rate for all male subjects and 95% for female subjects with sunglasses. For more information on the face recognition problem, click here or please refer to the paper Robust Face Recognition via Sparse Representation in the reference section. The dimension of imagery data is typically very high and that makes it computationally costly to process high-resolution images. The theory of compressed sensing offers basic principles for working with much lower-dimensional measurements of the images, without significantly compromising recognition performance. 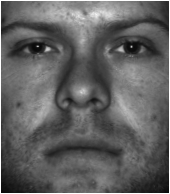 The example below shows some of the typical low-dimensional facial features one can use for face recognition. These features all achieve similarly good recognition performance when used in our sparse representation framework. For more information on feature selection, please refer to the paper Feature Selection in Face Recognition: A Sparse Representation Perspective in the reference section. Yi Ma, John Wright, and Allen Y. Yang. This website is maintained by the research group of Prof. Yi Ma, at the University of Illinois at Urbana-Champaign. This work has been supported by the grants: NSF CAREER IIS-0347456, NSF CRS-EHS-0509151, NSF CCF-TF-051495, and ONR YIP N00014-05-1-063. Any opinions, findings, and conclusions or recommendations expressed in this publication are those of the authors and do not necessarily reflect the views of the National Science Foundation or Office of Naval Research. Please direct your comments and questions to the webmasters - Zihan Zhou and Arvind Ganesh.